Some apartment complexes have weight limits, which put little dogs in high demand. Congratulations on wanting to save a life; making the decision to adopt instead of purchase a dog makes you a hero! Be patient, as small dogs sometimes are hard to come by because they are considered "highly adoptable" by adoption agencies due to the high demand. 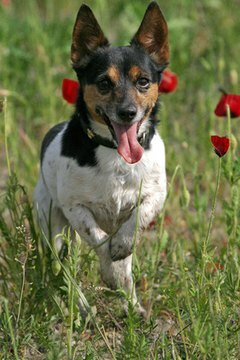 Visit your local animal shelter or county animal-holding facility to begin your search for a small dog. Many times you will be able to check the websites of these organizations to see what animals are available for adoption. However, it's best to visit in person because the websites are not always up-to-the-minute. There may be a dog on the website who is no longer available, or there may be a dog in the shelter who has not yet been listed on the site. Any time you visit a shelter or other adoption organization, leave your contact information with the staff. Let them know you are in the market for a small dog, and would like to be contacted when one is surrendered by a family or brought in as a stray. Statutory guidelines vary in different regions as to the holding period for strays, but if you're on the list, the moment the dog becomes available you will be called. Don't restrict yourself to shelters; leave your contact information at all animal-related businesses, such as doggy day care, veterinarians, groomers, pet supply stores and with individuals who offer pet-sitting services. You never know when one of their clients may have to give up their small dog and industry employees are where the client will go for help in finding a good home for their dog. Perform an Internet search for a breed-specific or small-dog adoption service. For example, if you are searching for a specific toy or small breed, find a group that specializes in that breed. There is a rescue group for any breed and you can try Lhasa apso rescue, poodle rescue, min-pin rescue, shih tzu rescue and so on. Alternatively, do a search under "small dog rescue" as there are many organizations that help all small dogs of any breed. These organizations frequently are comprised of breeders who want to keep their favored breed out of shelters and so they set up a network of foster homes for them. Find these rescue groups by visiting Petfinder.org or calling your county animal facility, as many municipalities require rescue groups to be registered with the county. Offer to become a foster parent for a small-dog rescue organization, or volunteer at a local humane society. If you cannot volunteer on a regular basis, offer to volunteer during a special event, such as an adopt-a-thon. If you already are involved with a rescue organization in any capacity, you are well situated to be called the next time a small dog comes into their system. It's unfortunate, but that's the way many rescues work. Those involved with the organization usually have first choice of adoptable dogs and the public never gets to see them. You may have to house several small dogs before the "right one" comes along, but that's a good way to get to know the breed and to see how you really feel about small dogs.